Dirt Bike Pegs on the FZ-09? Thread: Dirt Bike Pegs on the FZ-09? Thanks for the input, guys. I'm going to give these (https://www.amazon.com/gp/product/B0...CALLO5KB&psc=1) a try. They're cheap and if they're too tall or slippery I'll take off the rubber and go at them with a cutting wheel to give them some teeth. Have these on my FZ, they work pretty good. I had to shave a small lip off of the outer edge that put my foot at a odd angle. There are some aftermarket dirt bike style footpegs out there, like the Rizoma Rally Footpegs, but they are not cheap since you also need to buy the adapters to mount the pegs. There are also some height adjustable versions on ebay, like the following. The lowered pegs shouldn't be an issue as long as they don't hang down much further than the stock footpeg feeler pins. 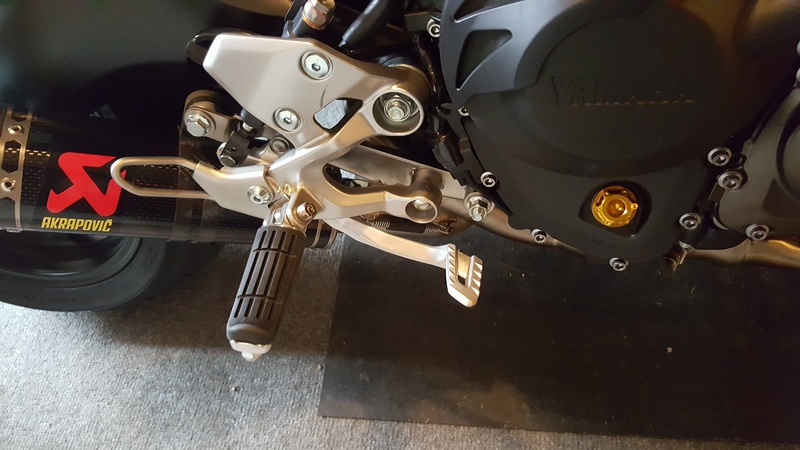 You might also need to purchase a set of new footpeg pivot pins since you'll need to drill out or grind off the shifter footpeg pivot pin to replace the footpegs. why do you want to know. I'm not sure I trust you with that information. I would echo what Moto26 said about boot wear. We race the mini-motos with CRF 100's and those pegs chewed through a pair of Sidi boots in one season, which hurts when you're talking about $300+ boots. I looked at these options, except the Rizomas, when I first got the FZ-09 in 2014. My leg was more flexible then but now, not so much. I'm occassionally scraping the outside edge of my boot in turns with the stock short pegs. My boots are 4E so that may have something to do with it. I'll try the FJR1300 pegs knowing there are several alternatives available if they don't work. Thanks for the input. When I was fast, motorcycles were slow. Now motorcycles are fast and I'm slow. "Black is the only color for a motorcycle, unless you want to sell it, then paint it red." I am pretty sure the rubber front pegs from the FJR will fit our bikes. Has anyone tried or successfully put dirt bike style pegs on a FZ?